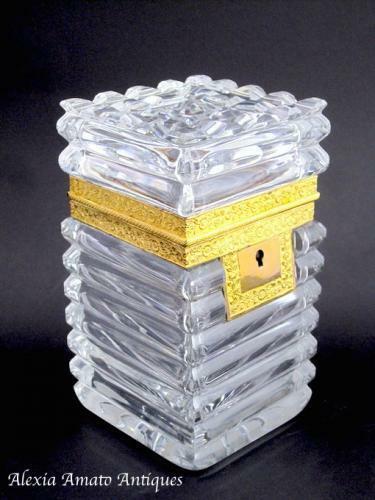 Antique Charles X ( circa 120) BACCARAT Crystal Casket Box. Horizontal Ribs Decorate the Body and Geometrical Diamond Patterns Decorate the Lid. The Mounts are Intricately Engraved with Small Flowers on a Matt Dore Bronze Background. Very Detailed Quality of Engraving. The Base has 16 Point Cut Star Burst. Exceptionally High Quality Baccarat Crystal.